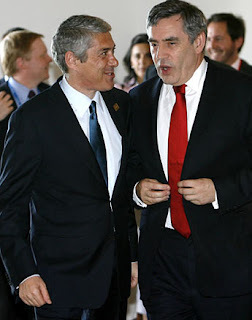 Hands up those who knew that José Sócrates, the Portuguese prime minister, had – like Gordon Brown – promised a referendum on the new treaty during his general election campaign! This blog should have known, but we have to admit that we didn't. But the fact is, it doesn't matter because, despite that promise, Mr Sócrates isn't going to give his countrymen a referendum anyway. The story is carried in The Times today, claiming that the referendum was ruled out by after pressure from Gordon Brown and President Sarkozy. So, while little Jim Murphy is telling us all to have a "mature debate", his master was doing his best to shut down the prospect of any debate at all in Portugal, for fear that the infection might spread to the UK where Brown might have to honour his promise as well. Brown, it appears, made "top level" phone calls to the Portuguese prime minister, alongside Sarkozy, a revelation says The Times that will "only increase suspicions that the European political elite have coordinated efforts to avoid a repeat of the referendums in France and the Netherlands in 2005 that sank the proposed constitution and plunged the EU into a two-year crisis." The newspaper is only wrong on one tiny deal. There is no "suspicion". For many months, it has been plainly evident that the zombies currently masquerading as our "democratic" leaders have been engaged in a carefully-crafted stitch-up to bounce their peoples into a further round of European integration. It comes as no surprise, therefore, to learn that the stitch-up continues unabated. One would like to think that Her Majesty's Opposition will be voluble in its protests but here the stitch-up continues as well. After the recent poll narrowing the Conservative lead to a mere four percent, and partially restoring the LibDims fortunes, David Cameron's party has taken fright. A centrepiece of its strategy for a return to government (of the bit that is left) is to attract voters away from the LibDims but, it seems, while some are attracted by the generality of Cameron's message, many are put off by the "anti-European" stance of the party. Thus, there is enormous pressure within the party to play down the EU issue, taking it off the agenda and muting any comments. Brown, therefore, is likely to get a freer hand during the treaty ratification than he expected and there are already plans afoot for the Tory front bench in the Lords to cave in when a planned amendment on a referendum is rejected by the Commons. Thus, every which way, we are truly being stitched up, leaving the British people without any real outlet to express their rejection of the latest treaty. And not only is Mr Brown at the heart of it, the Tories are set to allow him to get away with it. Too close to the truth? Do we know what it is we do not know? How could we possibly disagree? "A local authority in a new supranational body"
Do we have an unelected Prime Minister? Mr Brown wants to give them more powers? What is happening in the House of Commons? Galileo costs to "skyrocket" - shock!